Simon has recently moved to exciting new premises near Long Compton and Barton on the Heath on the Gloucestershire/Warwickshire/Oxfordshire borders, with expanded and more extensive facilities for teaching and training. The American barn has 13 large and immaculate stables. 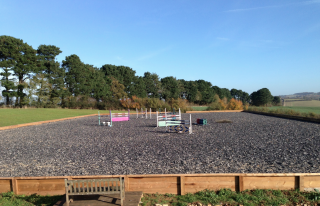 The flexi-ride all weather outdoor school (35m x 60m) provides a fabulous surface for training on, as well as amazing views. A large area of flat, well-drained grass near the arena is perfect for outdoor dressage arenas and jumping for most of the year. 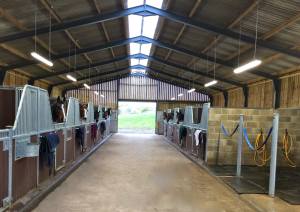 Plenty of parking, a 4 horse walker and excellent post and rail grazing, makes this the ideal base for schooling and competition liveries. Please contact Simon to discuss any livery or schooling requirements and rates.